Radiofarda – Gholamali Haddad Adel, a member of Iran’s Expediency Discernment Council and a close relative of Iran’s Supreme Leader, says Ayatollah Ali Khamenei has not expressed any view on two bills that would join Iran to the Palermo Convention about money laundering and anti-terror financing. Radiofarda – In an unprecedented move, an ultra-conservative website run by the Islamic Revolutionary Guards Corps (IRGC) has published an interview with former Iranian President Mahmoud Ahmadinejad, marking the first time state media has given the former president a platform since his term ended in 2013 amid soured relations between him and Supreme Leader Ayatollah Ali Khamenei. Radiofarda – The human rights situation in Iran has “severely deteriorated,” according to a February 26 report from Amnesty International (AI). 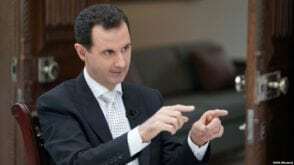 Radiofarda – On the same day Iran’s foreign minister Mohammad Javad Zarif agreed to take back his resignation, Bashar Assad invited him to visit Syria, reported the official news agency IRNA, without specifying a date for the trip. Radiofarda – Abu Dhabi’s state oil firm said Wednesday it has signed a $1.2 billion deal to build a storage facility on the Arabian Sea, as it seeks to bypass waters Iran has threatened to close. Radiofarda – The commander of Islamic Revolution Guard Corps (IRGC) Qods force, General Qassem Soleimani issued a statement on February 27 to mollify Mohammad Javad Zarif’s resentment, which apparently led him to resign two days earlier. Radiofarda – In his latest report submitted to the UN Human Rights Council February 27, UN Special Rapporteur on the Situation of Human Rights in Iran Javaid Rehman raised his concern over human rights violations in Iran, paying particular attention to the way the death penalty is carried out in the Islamic Republic. Radiofarda – President Hassan Rouhani has criticized lack of supervision on the performance and accountability of poorly-privatized companies. RFL/RE – A whirlwind eases with the Iranian president’s refusal to accept his smooth-talking foreign minister’s resignation. But that doesn’t necessarily mean Mohammad Javad Zarif has the political wind at his back. CHRI – The report of the UN special rapporteur on the situation of human rights in the Islamic Republic of Iran has now been made available on the documentation webpage of the 40th session of the Human Rights Council.